The worst kinds of days are those when I feel like I'm just constantly putting out fires. Emotions are flaring, tempers are raging, and mama is getting burned out fast! In my series on Tools for Discipline I explored some of the fundamental essentials of peaceful parenting: Connection, Rhythm, Imitation, and Environment. One of the reasons these tools are so powerful is that they emphasize being proactive, setting the stage for success rather than focusing on correcting problems as they occur. They are the opposite of putting out fires all day. 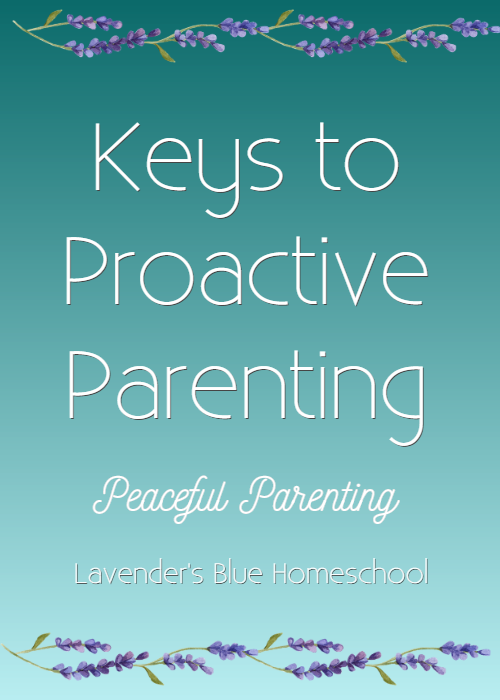 Today I want to dig a little deeper into the concept of proactive parenting and how operating in this way can help you to have a peaceful family life and prevent those flaring, raging, burn-out days. Proactive parenting means filling your days and your rhythm with activities that help your child be her best, most supported, calmest, most thriving self. Outside time - and lots of it! Everyone benefits from sunlight and time in nature. Movement – Provide lots of opportunities for active play, walking, running, riding bikes, climbing, jumping, swimming or playing in water. Rest and sleep – Promoting a habit of healthy sleep and a rest time each day will go a long way towards a happy child. Nutrition – Provide regular meals and snacks and avoid too much processed food or sugar. Telling stories – Listening to stories meets a soul need for children and provides an opportunity to heal, soothe, and connect. Art and Play – Children are naturally creative and they need to have lots of time for free expression in their play and with art materials. Try introducing more art time for a child who is agitated, anxious, or has trouble sleeping. Avoid overstimulation – You will go a long way just by avoiding media, loud music, and other jarring sensory input. Get comfortable with times of quiet, times of silence, times of just singing together. If your child seems particularly sensitive to background noise, pay attention to this. Laps – Sitting on laps, riding in babycarriers, backrubs, snuggles....touch is grounding and calming for children. Swings – Swinging is also surprisingly grounding and calming for children. If your child (especially a young toddler) is asking to swing a lot, pay attention to that! Your child is probably getting a lot of neurological and kinesthetic benefit from swinging so experiment with allowing her to swing as much as she wants. I spent many many hours swinging one of my little ones and I believe that she really needed that sensory input during her toddler years. The key to proactive parenting is observing your child, taking mental notes on what they need and how they respond, and building a solid rhythm around those activities. Focus your days and your energies on the activities that most build your child up and help her thrive. What is Waldorf-Inspired Kindergarten at Home?